It's late October...and Fall is in the air. Here in Texas, it's not terribly cool yet...but the worst of our heat is over for another year and evenings can be cool. That means one thing...soup weather! 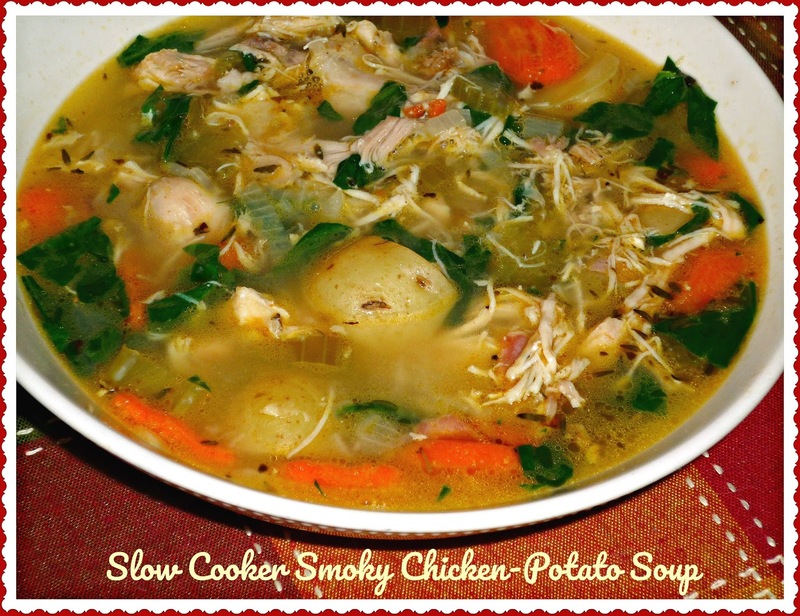 This week, #SundaySupper is focusing on comforting soup and stew recipes. I'm sharing a comforting Slow Cooker Smoky Chicken-Potato Soup that's hearty, without being overly heavy. It's a perfect weekend meal, because the slow cooker does most of the work. That leaves you time to take care of other stuff around the house...or maybe watch the Astros play World Series baseball! 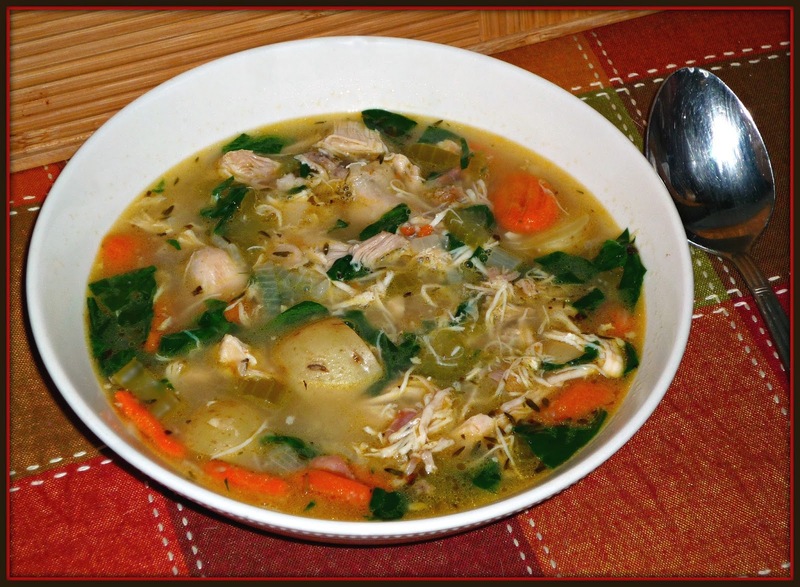 Boneless skinless chicken thighs, aromatic veggies, and creamy baby potatoes are healthy additions to this chunky soup. This hearty soup is definitely a meal on its own, but I added garlic toast on the side. A simple green salad would be a perfect healthy accompaniment too! Step 1: Add the olive oil to the slow cooker's insert on Brown/Sear mode. Combine the poultry seasoning and garlic powder, and season both sides of the chicken thighs with the mixture. Sear the chicken thighs on both sides. If your slow cooker does not have a Brown setting, brown the the thights in a skillet on your stove top and transfer to the slow cooker. 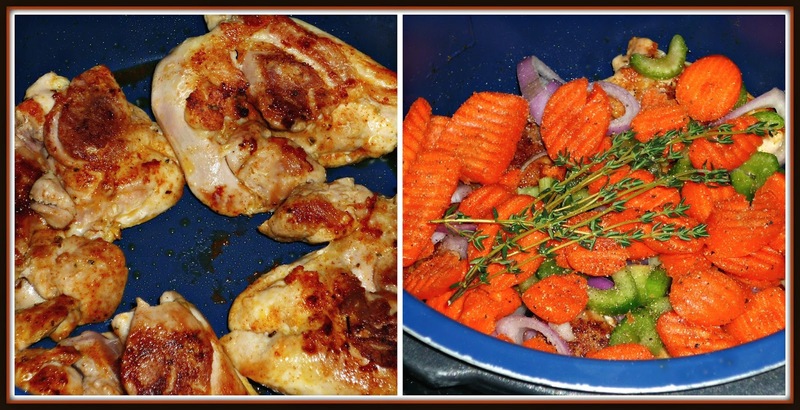 Top the chicken thighs with the shallot, carrot, celery, and thyme. 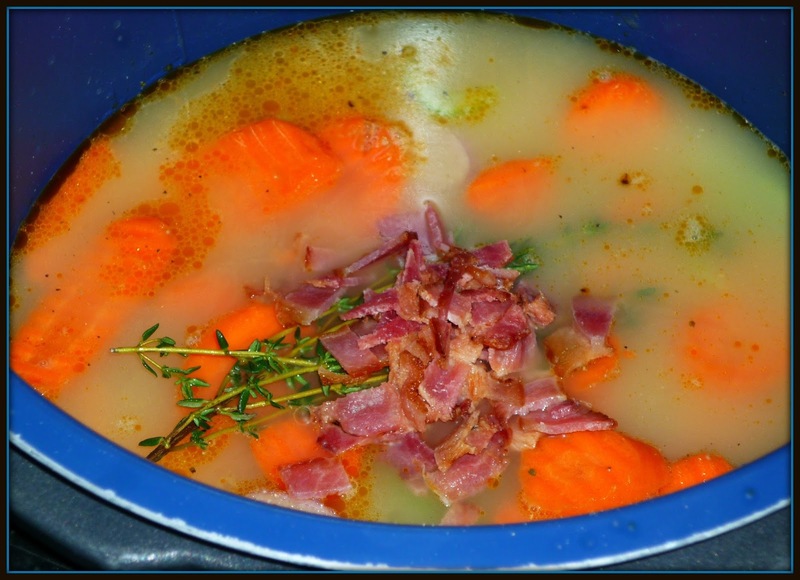 Step 2: Pour the chicken stock over the chicken thighs and vegetables, then add the crumbled bacon. Stir to combine, then cover and cook the soup on Low heat for 2 hours. Step 3: After the soup has cooked for 2 hours, uncover and add the potatoes. Cover and cook the soup and additional 2 hours. Remove the chicken thighs with tongs and chop. Stir in the chicken and chopped spinach. Cook another minute or two, until the spinach is wilted. Ladle the finished soup into deep bowls. This soup is perfect for Fall evenings -- it's chock full of juicy chicken meat and healthy veggies. The potatoes are a nice change of pace from noodles, and the crumbled bacon adds a mild smokiness in the background. 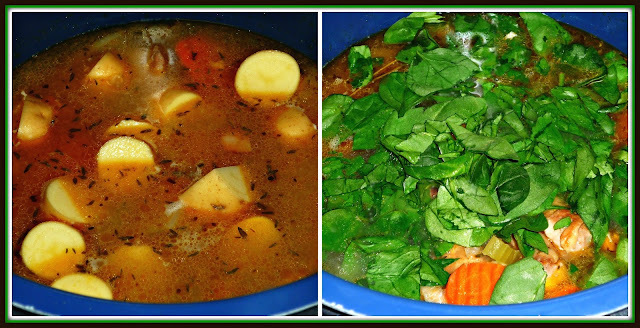 I loved this soup, and the leftovers froze perfectly -- which means we have dinner in the freezer for later in the week! If you're like me, you can never have enough soup recipes in your back pocket for the cooler months. You're in luck! 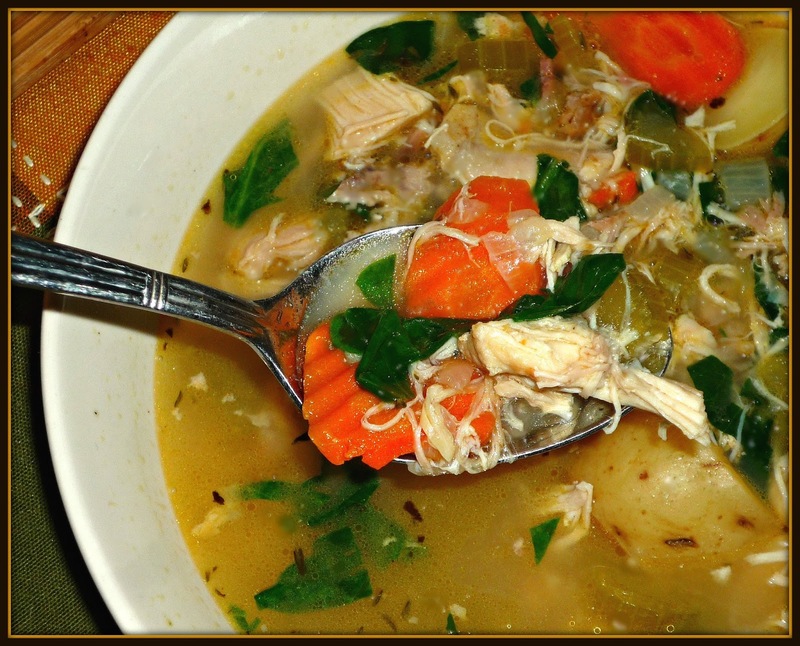 This week's #SundaySupper participants are sharing tons of fabulous soup and stew recipes for you to add to your repertoire. Simply check on the links below to check them out! Be sure to join the #SundaySupper conversation on Twitter today! We tweet throughout the day, and we share recipes from all over the world. Our weekly Twitter chat starts tonight at 7:00 pm ET / 6:00 pm Central. Follow the #SundaySupper hashtag, and remember to include it in your tweets to join in the chat. To get more great Sunday Supper Recipes, visit our website or check out our Pinterest board. Would you like to join the Sunday Supper Movement? It’s easy! You can sign up by clicking here: Sunday Supper Movement.